Since it is a vacation week, I find I have time to do a little cooking. Cooking is something I enjoy, but for 10 months of the year (and you can draw your own conclusions about which 10), I have little time to do it well. Hence the lack of posting on my other blog. One of my less endearing habits is that I tend to latch on to the latest and greatest cooking gadgets. Oh how I love getting a catalog from William Sonoma, Sur la Table or Crate and Barrel. I could spend significant time (and money) in those stores. So what does this all have to do with education? 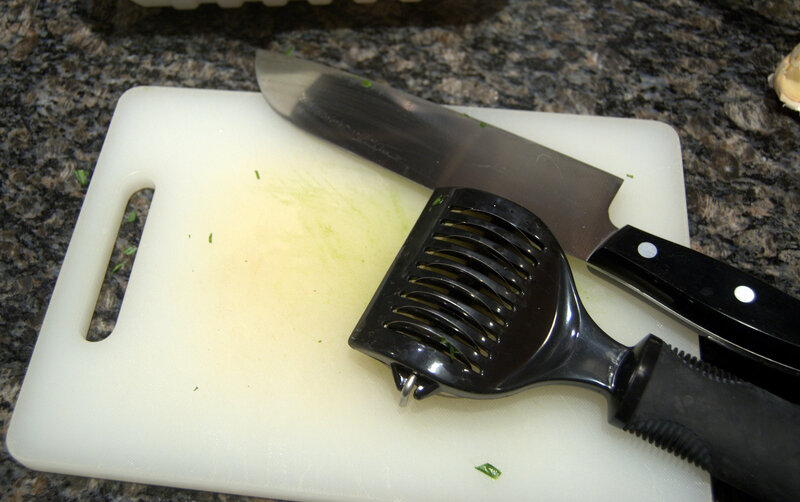 Well, as I was chopping up some parsley this evening, I pulled out a kitchen gadget that I haven’t used in years – a parsley chopper. As I started to roll my rediscovered gadget on a handful of beautifully fresh Italian parsley, the darn thing just would not cut. It mangled, it left cut marks, but it did not do the job any where near as efficiently or as well as if I had just simply used a knife and chopped by hand; which is exactly what I ended up doing minutes. later. This seems like a metaphor for the current state of education. Teachers all are given – and forced to use – some new gadgets or tools to improve their “performance”: a data collection program, a new curriculum. New ideas aren’t all bad, but with increasing frequency it seems that a lot of the new gadgets meant to help educators might just be meant to help some corporation bottom line first. Those are the ideas – and gadgets – we need to be wary of. To which I’d like to add and if you need a gadget to teach, then perhaps you’ve hired the wrong teacher as well. Very well said! I love reading your posts!